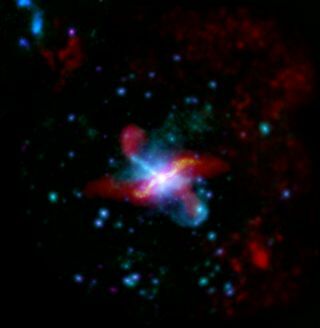 The peculiar galaxy Centaurus A in far-infrared (red and orange) and X-ray (blue/cyan/purple) light. Inner structural features seen in this image are helping scientists understand the mechanisms and interactions within the galaxy, as are the jets seen extending thousands of light-years from the black hole believed to be at its heart. An enormous nearby galaxy traces its birth to a cataclysmic collision between two older galaxies, new observations from two European spacecraft suggest. Previous images in visible light have hinted at a complex inner structure in Centaurus A, a giant elliptical galaxy found about 12 million light-years from Earth. The new views — captured in infrared and X-ray wavelengths by the European Space Agency's Herschel and XMM-Newton space observatories, respectively — map out that structure in greater detail and strengthen theories about its violent origins, researchers said. Herschel was able to peer through Centaurus A's central band of obscuring dust. The telescope's images reveal the flattened inner disk of a spiral galaxy whose shape is probably due to a merger with an elliptical galaxy long ago, researchers said. Herschel's data also uncover evidence for rapid star birth toward the center of Centaurus A (which is also known as NGC 5128), along with two jets emanating from the galaxy's core, one of which is about 15,000 light-years long. A look at the giant elliptical galaxy Centaurus A in multiple wavelengths of light. Clear correlation is seen between the jet features at far-infrared wavelengths and how they interact with their surroundings in the visible light view. Scientists think Centaurus A formed after a merger between two smaller galaxies long ago. "The sensitivity of the Herschel observations enables us to see not only the glow from dust in and around the galaxy, but also emission from electrons in the jets spiralling in magnetic fields at velocities close to the speed of light," Herschel project scientist Göran Pilbratt said in a statement. The XMM-Newton spacecraft recorded the high-energy glow from one of the jets. The telescope's observations show how the jet interacts with the surrounding interstellar matter and also reveals Centaurus A's intensely active nucleus and its large gaseous halo, researchers said. "XMM-Newton is well suited to detecting extended weak X-ray emission, often allowing us to see halos around galaxies for the first time," said XMM-Newton project scientist Norbert Schartel. The jets seen by both satellites are evidence of the supermassive black hole that likely lurks at the center of Centaurus A, containing about 10 million times the mass of our own sun, researchers said.